Welcome to the ‘Like a Local’ series! One of the best ways to experience a new place is to ask the people who live and work there for their recommendations. I think it’s a great way to understand a people’s mindset and culture by immersing yourself in their way of life. With that said, allow me to introduce you to the ‘Like a Local’ series: a place to share some of my favourite spots in Belfast, London and further afield with those who might find themselves with an urge to explore in the not too distant future. You’ll find some of these places in your travel guide; some are a little off the beaten track but all are guaranteed to give you a glimpse at local life. 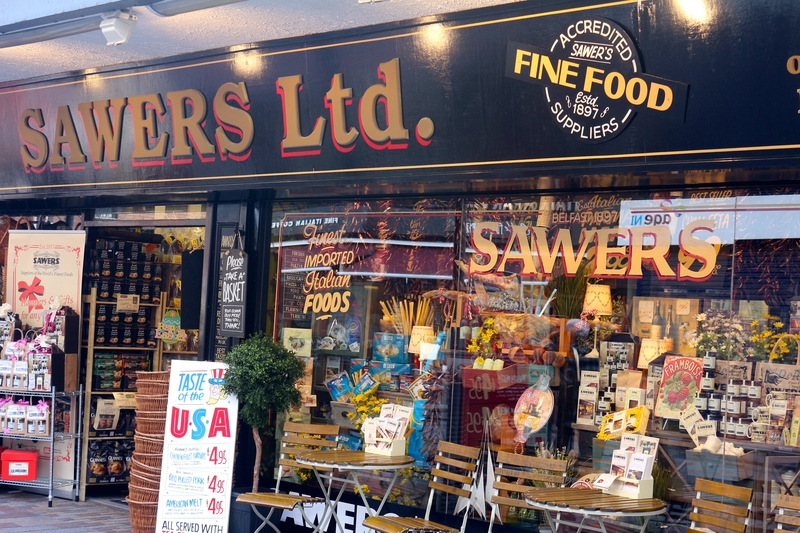 First stop is Sawer’s – pronounced ‘Soy-ers’ of Belfast. Tucked away down Belfast’s College Street – the street directly behind the big Boots on the main shopping street, Royal Avenue – this is Northern Ireland’s oldest deli. If you’re short on time but want to experience lots of local produce, or if you are craving a specific taste from your own home this is your best chance of finding it in the city. Established in 1897 Sawer’s has been a stalwart of the city centre through two world wars and The Troubles. A family run business the current proprietor actually started working at the store as a fish boy when he was just 16 years old. With food sourced from all corners of the world, and all parts of our beautiful island, Sawer’s is a food lover’s nirvana. It’s not cheap and definitely not a place to do your weekly shop but it’s where I go if I want to stock up on Suki Tea, Ditty’s oatcakes or Melting Pot fudge which my friend Sophie adores. If you’re in the city over the coming weeks or months be sure to stop by and say hello. With a bit of luck you’ll arrive when they’re handing out samples from their delicious deli. If you have a sweet tooth head straight for the counter at the back. Oh gosh, I know! I love to explore and see what new adventures we will both find!